We recently discovered this math video game which teaches multiplication facts. It doesn't just teach the facts, it ensures mastery. Unlike other free math games online, this one has excellent 3D video game graphics, making it much more fun to play. My son, who isn't even learning multiplication until next year, loves it. My daughter, who hates math (especially mastering the basic facts), tolerates it. She certainly chooses it over timed tests, flash cards, and other manipulatives. The basics of the game is that you are the little green guy you see on the left of the picture above. You wander around a dungeon looking for keys that unlock doors. When you find the key, a multiplication fact appears on the wall along with a picture representation of the problem. Little snail-like creatures shoot out from the wall which you collect and throw back at the wall to skip count the answer. Then you type in the answer which opens the wall. When the wall opens, out comes an ogre whom you must "fight" not with swords or magic spells but with answers to multiplication facts that appear on his belly. You better be fast because there's a timer at the top of the screen. Get the answer wrong or take too long and you take a hit. Once you beat the ogre, you get another key and continue on your journey. The game play proceeds in such a way that your student is both challenges and allowed to succeed at the same time. You start out with just one fact to learn (4x2) and build on that one fact at a time. As you proceed, you are expected to know all of the facts leading up to your current place. When you've beaten all of the ogres on the level, you challenge a giant ogre to demonstrate you know all of the facts in that family. Beat him and you move up to the next fact family. The game starts with 2's and moves up until you reach 12's. My children are on 4's right now. So far, each level has focused only on problems in that fact family rather than a mix from all of the previous fact families. I'm not sure if or when they'll reach a level that mixes the fact families. Another thing that the game does is keep track of your student's progress and adapt accordingly. I believe that the timer speeds up or slows down based on your student's needs but I'm not 100% sure on that. I do know that when your student reaches the big ogre and does not win the battle, they are told which facts they had difficulty with and given the chance to practice those by fighting those specific little ogres again. The best thing about the game? It's totally free. Fill in the form to receive the download link via email. The free version even tracks multiple students (I don't know how many) and saves their progress. If you wish to buy the upgrade, it only costs $39.99 to download and $5 extra if you want a copy on CD. The upgrade provides additional worlds to explore. The only thing that could improve the game is to include addition, subtraction, and division versions of the game. 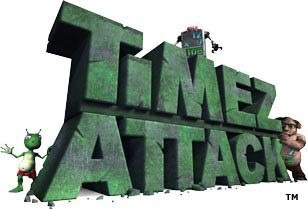 ***Note: The Timez Attack makers offer an affiliate program. The links above are not affiliate links. I do not make any money for you following the link or purchasing the program. I did not receive anything in exchange for this review. I just like the program and wanted to let you know about it...especially since you can get all you really need for free. Cool! I'll be needing that before too awful long! OY!